In complete contrast with the sumptuousness of the Salle Richelieu is the Théâtre du Nord-Ouest. There Théâtre Élan has been running a programme that is experimental in a number of ways. They divide the year into two six-month-long seasons in each of which they present 30 or more plays in repertory organized around a theme or a single playwright. In 1999 they presented the complete works of Racine, in 2000 Musset and in 2001 Corneille. July-December 2002 will see the complete stage works of Hugo. Théâtre Élan accomplishes these massive projects by presenting the works in no frills productions. In the two I saw, HORACE and POLYEUCTE, both held over from the Corneille festival, designer Catherine Lainard provided uniform costumes for the men and the women cut from varying shades of the same blue cloth. There are no sets and no music or sound effects. The plays rely solely on acting, movement and lighting for effect. Neither of the Théâtre du Nord-Ouest's two spaces is ideal. The Salle Laborey, where I saw HORACE, is situated in an old nightclub (where Edith Piaf made her professional début). The seating and playing areas have been reversed so that the audience sits in seats at the lowest point on what was the stage and watches the performers act on the four descending tiers of what was the seating area. The Métro rumbles below, footsteps are heard from the foyer above, sounds drift in from the other theatre and the black paint does not fully disguise the theatre's need of repair. The smaller Salle Economidès is on the same level as the foyer, located seemingly in an apartment whose walls have been knocked down leaving occasional ducts, pillars and water pipes running from ceiling to floor between the seating and playing area. The theatre can have three shows booked at staggered times in its two performing spaces. It does not sell tickets in advance, so that everybody just walks up 20-30 minutes before the show and buys a ticket (top price 20 euros) as one would for a movie. 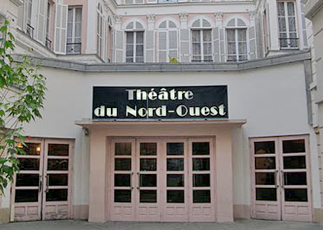 The Théâtre du Nord-Ouest is thus not meant for patrons who prize glamour of production or surroundings. Théâtre Élan's Artistic Director, Jean-Luc Jeener, also the director of both plays I saw, was far more successful with HORACE than POLYEUCTE. In HORACE he was blessed with an energetic young cast without a weak link. The story concerns the legendary battle of the Latin Horatii with the Alban Curatii for control of Rome. Each set of three brothers has ties of love or marriage to the other side so that the victory of side can only mean tragedy. Olivier Lacoma as Horace made all too believable a character whose devotion to the state makes him slip from war-sanctioned slaughter to civil murder. Véronique Balme gave a magnificent performance as Horace's sister Camille, whose rage at her beloved's death at the hands of her brother precipitates her own death at her hands. This scene between brother and sister, which outraged Paris for breaking the rules of decorum, was truly horrifying and acted with much more violence than one might expect at the Comédie Française. All the players were excellent: Isabel de Francesco as Horace's Alban wife Sabine, Thierry Xardel as Camille's Alban lover Curiace, Pascal Guignard as Valère, who feels Horace's crime outweighs his benefit to the state and Bernard Frémaux as the Horatii's father whose rigid sense of duty he has passed on to his sons. Nowadays we would be most inclined to view Tulle's pardon of Horace in a cynical light. Jeener allows for ambiguity by having the characters' faces turned away from us throughout Tulle's judgment and into the final fade-out. Corneille's questioning of when the state should and should not sanction murder now seems more relevant than ever. This same director, who showed such insight in HORACE was unable to make POLYEUCTE, one of Corneille's sequence of four masterpieces, seem like more than a period piece. This need not have been so since the play concerns a character who after recently converting to Christianity abandons his wife of two weeks to seek martyrdom by toppling pagan Roman images. Jeener could have chosen to depict Polyeucte's zeal as a kind of fanaticism of the newly converted, a fact born out by the incomprehension of the non-Christians around him, including his wife Pauline and his father-in-law Félix. Rather than underline the all-too-contemporary conflict between the state and religion, Jeener made POLYEUCTE seem like an unconvincing, rather tedious martyr drama. Jeener also does not have gift of the flawless cast he had in HORACE. The one actor who really saves the show is Caroline Victoria as Pauline. Her portrayal of a young wife trying to keep some equilibrium despite her husband's growing obsession was gripping throughout. But her intensity tended to dissipate in the vacuum around her. Jeener treated Stratonice (Pauline de Meurville) as nothing more than a stock confidante even though her rabid anti-Christian sentiments make her much more than that. As for Polyeucte himself, Emmanuel Dechartre did not explore the mania that animates him and links his character to the overly rigid Horace. As Félix, Bernard Mallek never created the sense of menace his character should have. On the other hand there were fine performances from Eliezer Mellul as Félix's confidant Albin and from Anatole de Bodinat as Sévère, a Roman youth still in love with Pauline. Though not the success that HORACE is, I felt lucky to see as rare a play as POLYEUCTE at all. HORACE and POLYEUCTE run in repertory with 28 other plays at the Théâtre du Nord-Ouest (33.01.47.70.32.75), POLYEUCTE until March 17 and HORACE until March 31. Note: A version of this review appeared in the TheatreWorld (UK) 2002-02-03.